You know that first moment when you dig out last year's sandals, dust them off and slip your feet in? Cast aside the tights and boots?.. I'm there! In honour of Spring, Mel another crafty mama in our school Craft Group recently guided us through some lovely simple projects with pure wool felt and handsewing. 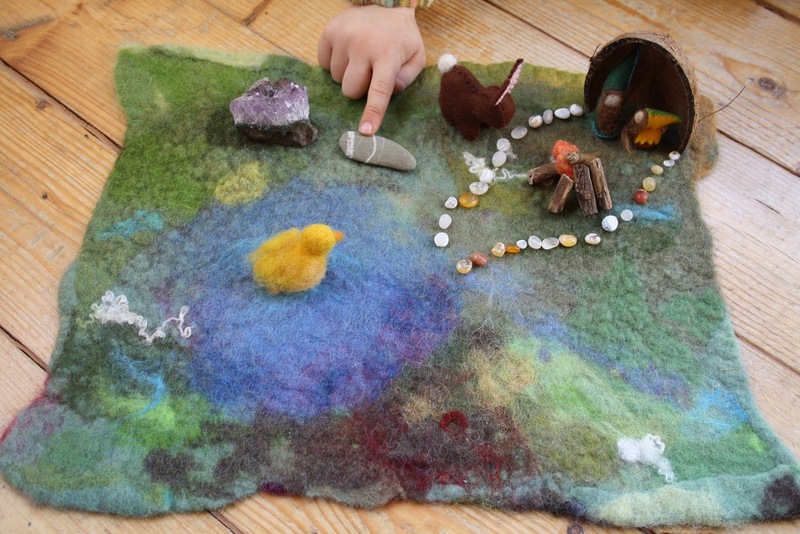 We began with a little gnome in a bed..
followed by a session where we made our own felt from which to fashion these mama and baby birds.. The babe slots snugly into the mama's winged back... very endearing. 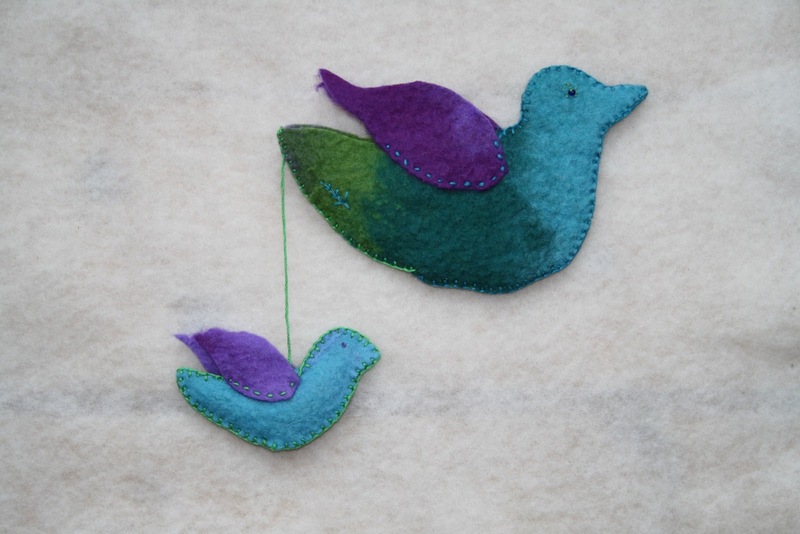 The difference between using felt that you buy and making your own, is immeasurable. With handmade felt you are master of the colour, the thickness and the texture. 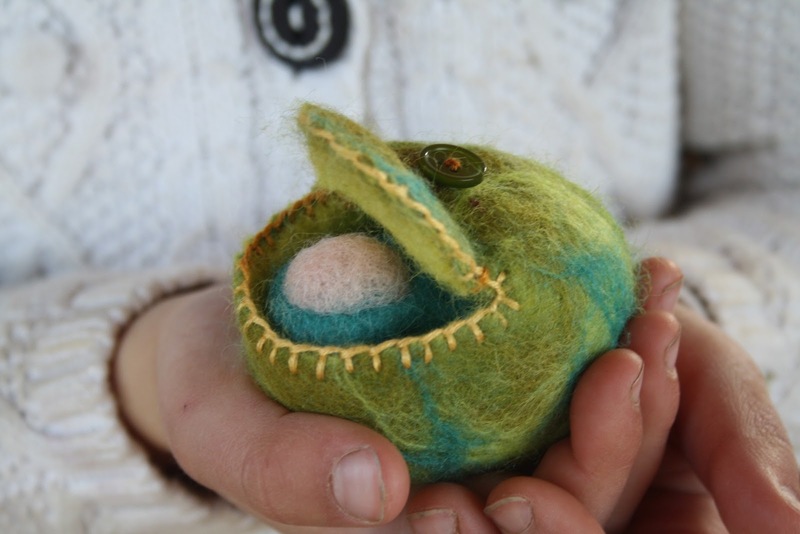 I've always loved the element of surprise that awaits, upon the completion of a creative process. Wet-into-wet watercolours have this quality. You merely touch the wet paper with a loaded brush, and whoosh ...you never know exactly where the colour will spread or how it will look when it dries. 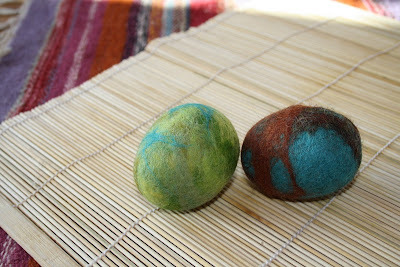 Wet Felting is like this in the most delicious way. 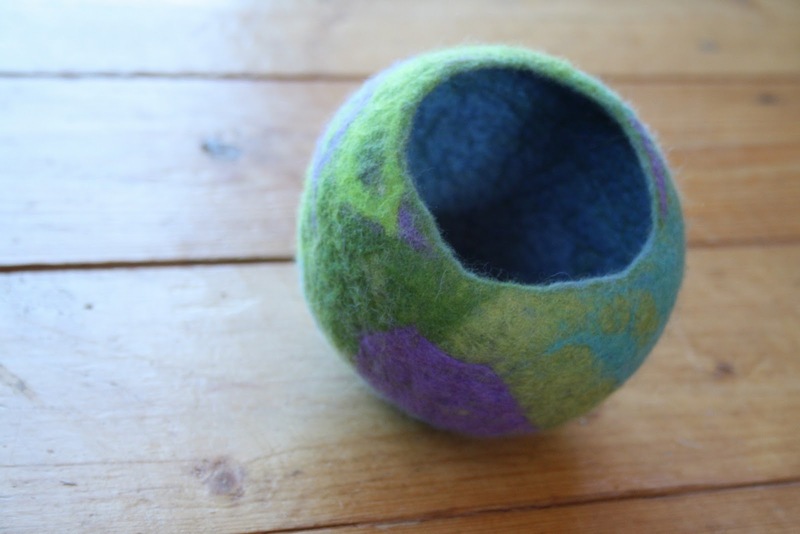 I almost feel like the wool comes alive in my hands in the felting process. All my attachment and intention when I carefully place the wool in the first stage, I happily let go of when I sprinkle the hot soapy water in the second stage. 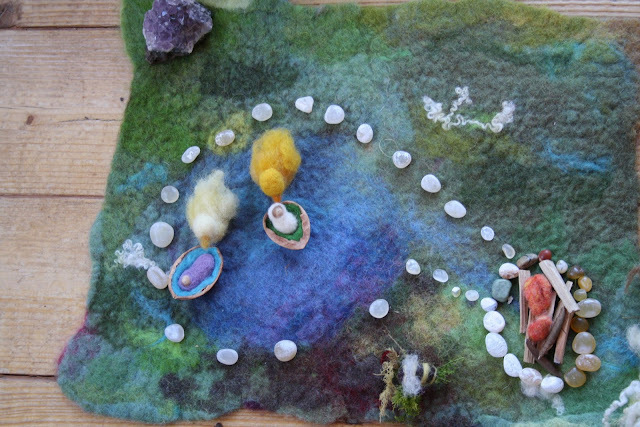 For the felt will go its own way. I love that! The fibres grow together and eventually the most amazing texture rises...a characteristic you can neither predict or necessarily design. 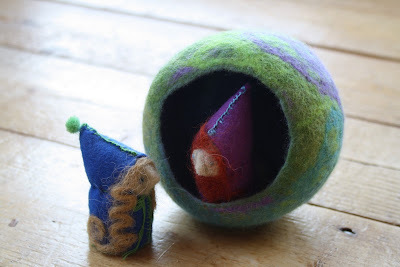 One way or another the wool will surprise you. And, brilliantly, all those separate layers of loose soft fibres integrate to produce a fabric so strong, it cannot be pulled apart. 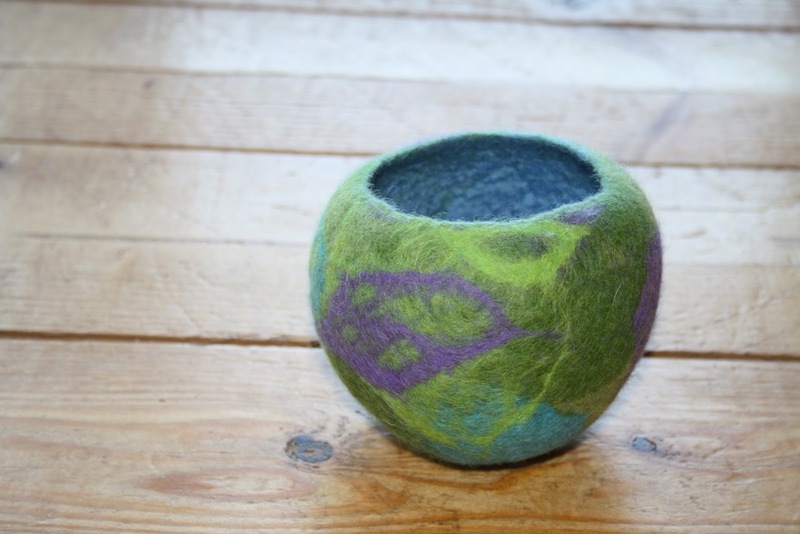 Here, I had a go at a three-dimensional piece, making a wet felted Vessel. This, I'm really interested in taking further, but more on that later. 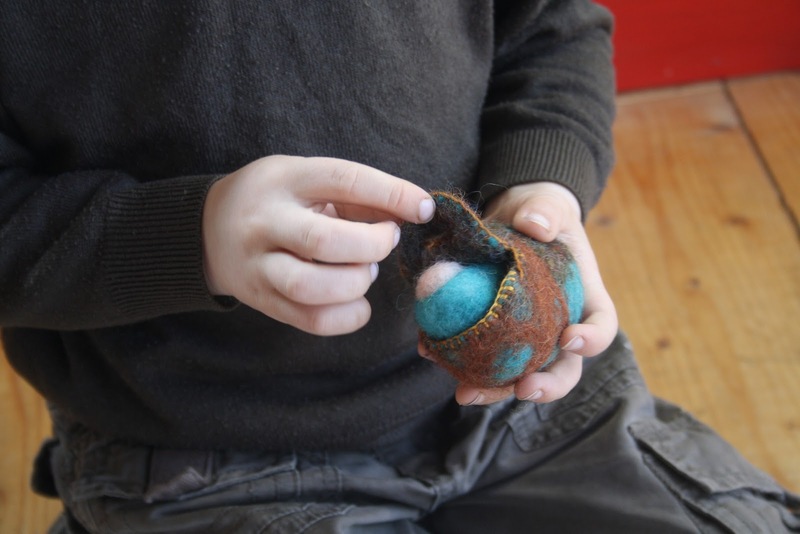 For anyone with a young child in their lives and the inclination to craft with them, this is such a lovely project to share. You'll find a tutorial here. There's a beautiful array of coloured wool available at the Woolly Gathering shop for this, or try your local craft supplies shop. 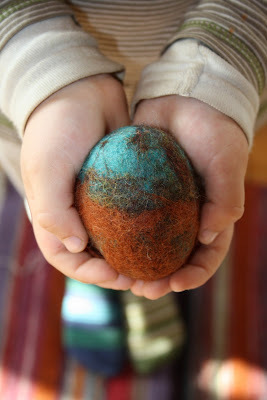 It was magic to do this with my son, he adored the felting process. and is enchanted with his egg babe.. 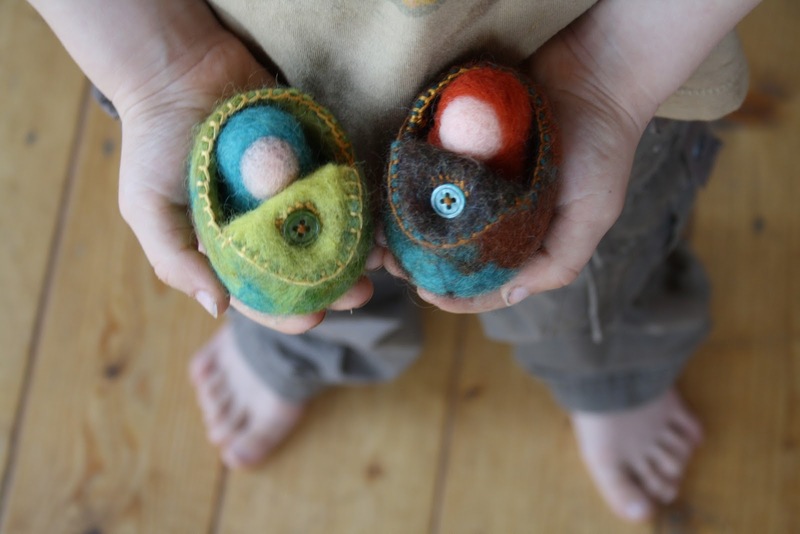 It's so meaningful for a child to play with a toy born of their own hands. It connects them closely to the natural world, when you can so simply help them trace the journey from sheep on the hill, which we see all around us, to wool, to their handwork, to beloved toy! I gathered some other small things I've made over the months, and some natural bits we've collected on walks and popped them all on the floor. Then, my small boy took it to a whole other level, with much loftier ideas indeed! He placed what he told me was a bench for the gnomes to rest on by the water...And so started the first story. When little friends came to play and began setting up a farm on the floor, I was touched by how much it seemed to enrich their play when I slipped in the playscape. 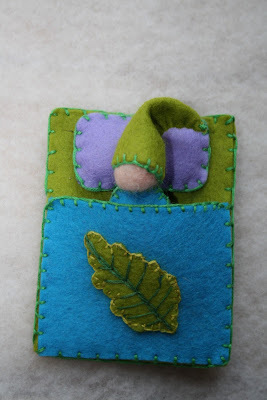 All in a moment, the animals had a context, their feet rested on soft green. The meadow had a boundary. 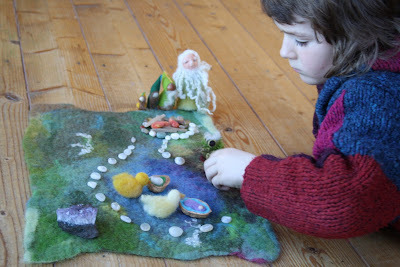 The pond asked for ducks...the stream asked for stepping stones. 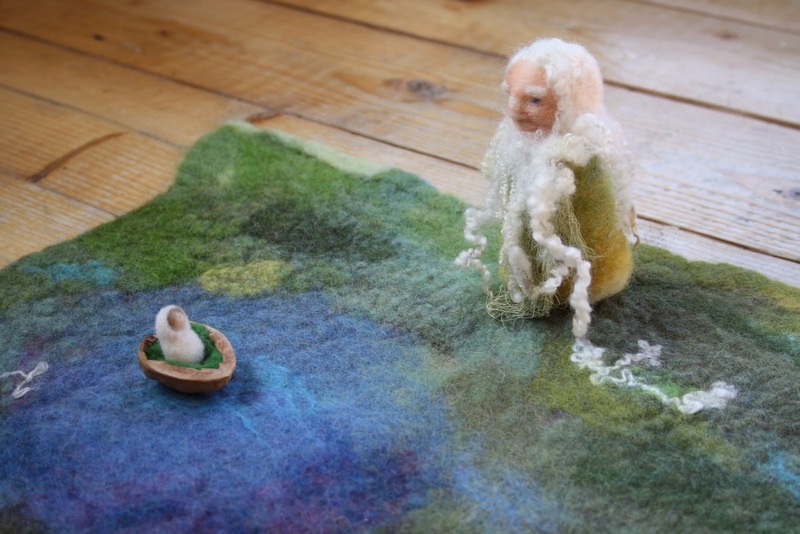 This piece also appears on the Woollygathering blog. 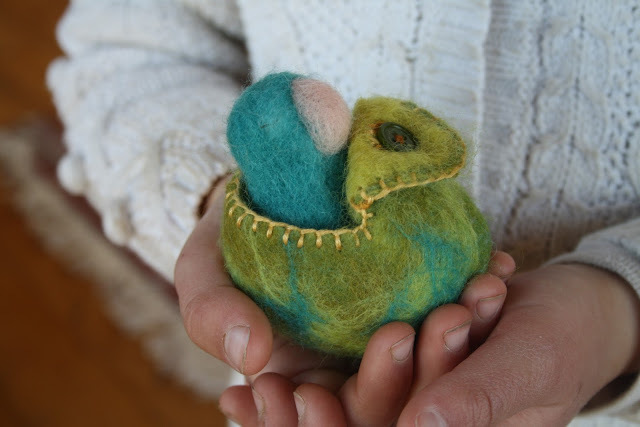 What a lovely blog and such a treasure trove of crafting in Tuamgraney. I live near Loch Graney so am not too far away. I am looking forward to coming along one day soon.